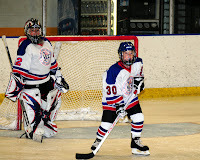 Brandon had his first two games this weekend as a VF Colonial. He is wearing his friend, Jacks uniform because his didn't come in yet. So temporarily Brandon is an "Orendorff" until his new uniform arrives. So far the Colonials lost the first game and tied the second against the Phantoms. Brandon is doing a great job at defense and is building up his confidence when he is checking an opponent against the boards! I am looking forward to a wonderful season! Go Moose!